The Shoshone, Wind, and Bighorn Basins located in Wyoming, feed the Bighorn River here in Montana. This map shows near current snow water equivalents as a percentage of normal. We have plenty of snow piling up in the Bighorn Valley, and more importantly, in the mountain ranges that feed the river! Water is generally a good thing for rivers and trout. But the last few seasons, we have, at times, had too much of a good thing. This was especially obvious last spring when flows peaked at 15,000 cubic feet per second (cfs). The Bighorn River Alliance has been aggressively lobbying the US Bureau of Reclamation, which operates Yellowtail Dam here on the Bighorn, to be more proactive in dealing with water runoff in years when it is clear that there is going to be an excess. 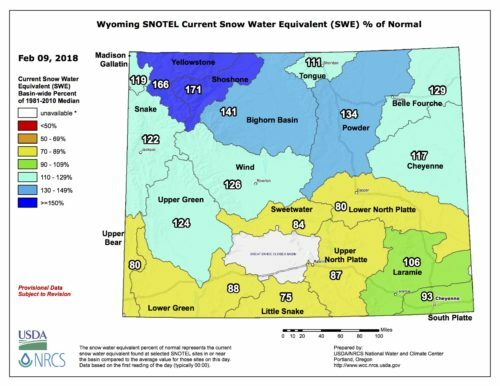 This year is shaping up to be a year of excess, with snowpack levels well above average in the Wind, Bighorn, and Shoshone Basins which feed the Bighorn River in Montana. This week the Bureau of Reclamation (BOR), which operates the dam, released their spring runoff projections. The good news is that it appears the BOR is listening and planning accordingly in order to avoid extremely high flows this season. Current water releases out of Yellowtail Dam are at 4,500 cubic feet per second (cfs), which is higher than normal for this time of year. But this is a good thing, because it is making room in the reservoir for spring runoff that will come later. According to BOR, Bighorn River flows are expected to peak at about 7,000 cfs in May before dropping to 4,500 cfs in July. This is great news! The river should have a ‘bump’ in spring flows. Increased flows in the spring helps cleanse the river of silt and algae which is good for insects and the trout that feed on them. Higher spring flows also facilitate better spring spawning conditions for rainbow trout. 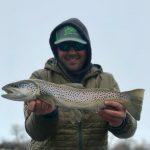 So having the river flow at 7000 cfs for a couple of months isn’t really a bad thing, and is extremely manageable from a fishing and guiding standpoint. Generally speaking, the river tends to fish very good at these levels. We expect the spring nymph fishing will be very good. At the same time, we should still see good blue wing olive (baetis) and midge hatches in April and May. The predicted water levels will still be wadeable in spots, making it possible to take advantage of dry fly fishing opportunities. Obviously we are keeping our fingers crossed that the Bureau of Reclamation’s projections will hold true, because if they do, it should set up some really good fishing conditions this spring! If there were some kind of competition in life that was judged by whoever got to fish and hunt the most, we’re pretty sure John Shirley would be somewhere in the top 3, all-time. Joking aside, you would be hard pressed to find a more passionate fly fisherman and bird hunter than John. He demonstrates that by spending literally hundreds of days a year doing both, whether guiding, going with friends or traveling to saltwater destinations. A native of Great Falls, Montana, John cut his teeth fly fishing at an early age on the various streams and rivers around the state, including the Missouri River. In high school he recalls driving the frontage road along the Missouri looking for pods of rising trout, long before the river was discovered and became the high profile fishery that it is today. After a stint in the corporate world with a company in Boise, Idaho, John quit his job in 1998 and moved back to his home state of Montana. He built a wooden drift boat, and became a full-time professional fishing guide on the Bighorn River. John’s passion for fly fishing has taken him wide and far. From the saltwater flats of the Yucatan Peninsula, to Honduras, Texas, Belize, Louisiana, the Florida Keys, and the blue ribbon trout rivers of the Rocky Mountain West, he loves them all. But what is probably most amazing is that for a guy who has caught trophy trout, permit, tarpon, red fish, snook, jacks, bonefish, barracuda, etc., he can often be found during the off season just as happily catching channel catfish in the slough right near his home on the banks of the Bighorn. Since 2002 John has co-managed Eagle Nest Lodge with his wife Rebecca, and despite the additional demands and duties, he still finds time to guide a number of days each season and claims that his drift boat and bird truck are the best office he could ever hope for. 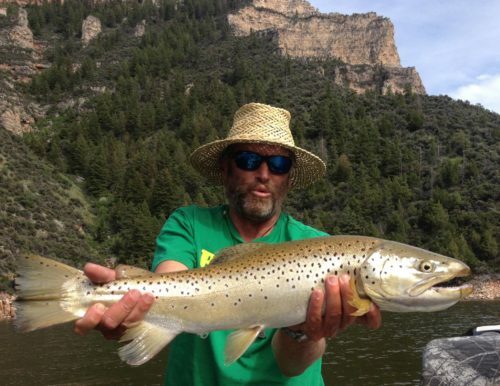 A native of Utah, Dell started fly fishing as a kid on trips to the mountains with his Dad. Those early experiences lit a fire for the sport that still burns bright 5 decades later. 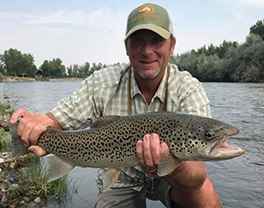 In 1998 Dell sold his successful bakery business in Utah and found his way to Montana and began guiding on the Bighorn that same year, giving Dell 20 years and thousands of days on this blue ribbon trout fishery. During Dell’s guiding career he has worked nearly every major river in the state, from the freestone streams on the western edge of Montana, to the spring creeks of Paradise Valley. In 2006 alone he guided on 12 different rivers around Montana! These days he has narrowed his focus to the Bighorn. Having fished and guided a wide range of places, Dell feels that without a doubt, the Bighorn is one of the best. He is also known as an innovative fly tier and is a Signature Fly Designer for Yellowstone Fly Goods, a Billings, Montana based wholesale fly production company. Known among fellow guides for his passion and love for both fly fishing and fine cigars; he’s also somewhat famous in the Valley as a good natured practical joker. Among clients he’s known for his seasoned professionalism, focused work ethic and willingness to tailor the day to meet his anglers needs and expectations. Whether you are a novice, an expert dry fly technician, or somewhere in between, Dell draws from a deep well of experience and can show you the best of what the Bighorn has to offer. Dell lives in Billings with his wife and three children Scout, Emma, and Magnus; and his loyal Jack Russel, Bob. Around most fly fishing lodges and shops it’s not uncommon to find guides hanging around at the end of a long hot day rehashing events; flies that worked, runs that fished well, jokes, whatever, are the usual conversation. These informal debriefs usually take place around a drift boat, which serves to prop up said guides, and makes a convenient drink holder for the customary cold beers that are enjoyed. Go to any trout river in the West, and at days end you’re likely to spot one. And if you really want to know the low down, this is the place to get the goods. It’s known among trout guides as “The Boat Lean”. We’ve actually had a blog on our website for quite a few years now. This season we are planning to add more content to keep you better connected to what’s happening here on the Bighorn and at Eagle Nest. We will be inviting some of the guides to help out in order to bring new content and for their perspective on what’s happening- including more timely and up to date fishing reports. In addition to fishing and hunting reports we would like to add some gear reviews, fishing and hunting photos and even some short articles for your reading enjoyment. So give us a bookmark on the link above, grab a favorite warm or cold beverage, and welcome to The Boat Lean. Thank you and we hope you enjoy! “Steady as she goes” would be an apt description for guide Sam Boggio. At Eagle Nest we understand the importance of having quality guides to spend your day with on the river. After all, you spend a large portion of your time here with them, and a good guide, regardless of how the fishing happens to be, can make or break your overall experience. Fortunately for us, the majority of our guides have been with us for many seasons. Although many of our guest who return season after season have developed friendships with these guys, we want to take some time to introduce them on an individual basis so you can get to know them a little better. Few guides in the entire Bighorn Valley can claim to have fished the Bighorn longer than Sam Boggio. Born and raised in Hardin, Montana Sam has been fishing the Bighorn for nearly 4 decades. As a kid Sam recalls that day when his uncle asked him if he wanted his old fly rod to try using on the river. Sam took him up on that offer, and despite what he describes as a rough beginning, he stuck with it, achieving a skill level that today few will ever attain. When Sam was 14 years old he started tying flies commercially for the now closed Quill Gordon Fly Fishers, one of the rivers very first fly shops to open. At 19 years old Sam did his first guide trip on the Bighorn for Eagle Nest Lodge, and as trite as it may sound, he never looked back. 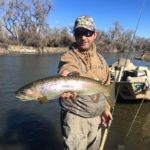 The 2018 season will mark Sam’s 20th season as a full time professional guide on the Bighorn River. We would estimate that 20 years represents well over 2500 guide days, not to mention all the personal fishing days in there as well. In a profession where experience counts, few can draw on that kind of knowledge. In addition to being a fishing guide, Sam has also worked 10 seasons as a big game guide for elk and deer. “Steady as she goes” is an old seafaring term, and would be a pretty apt description of Sam’s style. Sam is also know for his sharp wit among fellow guides, who despite repeated attempts, are usually stymied when trying to give him a good burn from time to time. Good natured and quick with a joke, if you ever want to get Sam really talking, just bring up elk hunting. But don’t be fooled, Sam’s first love is still fly fishing, and that pursuit has taken him from the trout filled blue ribbon rivers around Montana and Wyoming to the saltwater flats of the Yucatan Peninsula. Sam lives in Billings, MT with his wife and two young children Edison and Emmi. What are you doing if you’re not fishing: Probably elk hunting or thinking about elk hunting.